The new station to be built at Davies will have a 1,400-spot park-and-ride facility and a transit centre. Image courtesy of Betchel Corporation. The FLEXITY light rail vehicles offer a smooth and comfortable ride for passengers. Image courtesy of Bombardier. Phase 1 of Valley Line will originate at Mill Woods Town Centre and terminate at the downtown Edmonton. Image courtesy of Thankyoubaby. Valley Line is a proposed light rail transit (LRT) system that will connect Mills Woods in the south-east and Lewis Farms in the west, through downtown Edmonton in Canada. With 25 stops and three stations, the 27km-long line will be developed in multiple phases and serve approximately 100,000 passengers a day. The first phase of the project will include a 13.1km-long section between Mill Woods and 102 Street. It will provide access to the Capital Line and Metro Line at the Churchill Station. Construction of the first phase is scheduled to start in 2016. The Valley Line is the key aspect of City of Edmonton’s transportation plan, which is intended to cater the transportation needs of the second fastest growing city in Canada. The PPP project will involve a design-build stage of five years and a 30-year operation and maintenance term. The first phase of the project running from Mill Woods to downtown will include 11 stops and a new station building with two floors. A new bridge on the North Saskatchewan River, a 350m-long tunnel and an operations and maintenance centre will also be built under the project. The first phase of the Valley Line will originate at Mill Woods Town Centre, and will pass through Grey Nuns, Millbourne/Woodvale, Davies, Avonmore, Bonnie Doon, Holyrood, Strathearn, Muttart and Quarters, before terminating at the Churchill Station. The second phase will connect the Churchill Station with Lewis Farms, via Glenora, 95 Avenue, Meadowlark and West Edmonton Mall. Phase 1 will involve the construction of a new station at Davies in the Wagner industrial area. The station will have a 1,400-slot park and ride facility, and a transit centre. Bombardier Transportation, one of the members of TransEd Partners Consortium, was awarded a $280m-worth contract to supply light rail vehicles for the Valley Line light rail transit system. Bombardier Transportation will be responsible for the design and supply of the FLEXITY light rail vehicles, signalling and communication, power supply and distribution, overhead catenary system and depot equipment for the new line. Each vehicle will have a capacity to carry 275 passengers. The FLEXITY vehicles feature conventional wheel-set bogies and high-end crash performance efficiency. The 100% low-floor vehicles offer easy access to disabled passengers, prams and heavy shoppers. 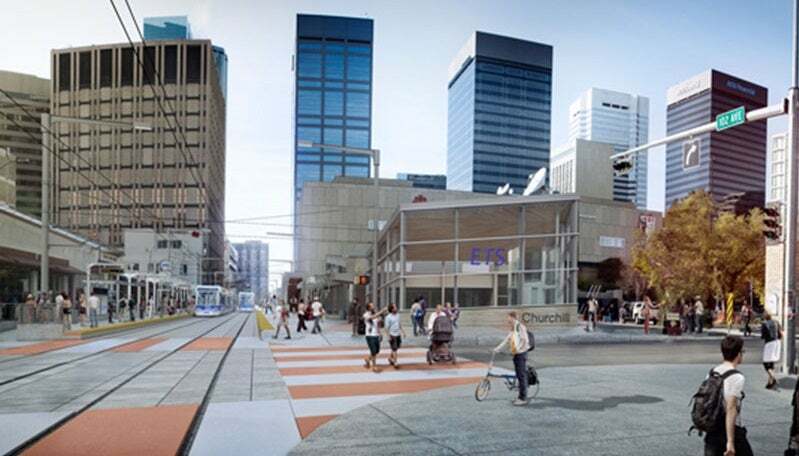 The City of Edmonton awarded a public-private-partnership (PPP) contract worth approximately $1.3bn to TransEd Partners Consortium to design, build, operate, maintain and finance the first phase of the Valley Line light rail project. "With 25 stops and three stations, the 27km-long line will be developed in multiple phases and serve approximately 100,000 passengers a day." The TransEd Partners consortium includes Bechtel Canada Company, Betchel Development Company, Fengate Capital Management, EllisDon Capital, EllsiDon Civil, EllisDon Facility Services, Bombardier Transportation, Veolia Transportation and AECOM. Other key partners of the consortium include Transdev, Arup Canada and IBI Group. Bechtel is the engineering, construction and project management service provider for the project. Fengate will provide investment management services, while Ellis Don is responsible for the financial advisory, construction and facility management services. AECOM will provide engineering services for the project. The $1.3bn project will receive funding from the provincial and federal governments. The City of Edmonton will contribute $585m, while the province of Alberta will source approximately $440m through an interest-free loan and Green Trip funding. The federal government will contribute approximately $290m through PPP Canada and the New Building Canada Fund. TranzCom offers products, complete installations and optimal maintenance services to the railway industry. With over 20 years of experience, we provide state-of-the-art technology as well as innovative and personalised turnkey solutions. Australian Rail Technology (ART) is a leading provider of rail solutions. It is a system and technology integrator of complex rolling stock, electrical and infrastructure systems.